The first Solidlights products to be sold used the Lumileds Luxeon III LEDs, which were state of the art back in 2003. 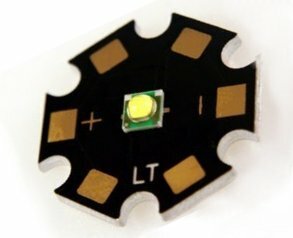 Technology has moved on since then, however, and modern LEDs are much more efficient – they produce a lot more light for the same amount of electricity. Though I’m no longer actively developing Solidlights, I occasionally tinker with upgrades to the ones I use regularly. For a year or so now I’ve been using a modified Solidlights 1203D dynamo light fitted with Cree XP-G2 LEDs. Getting the best from them requires modifications to the lenses, too, but it’s worth it: the theoretical maximum light output from each LED is 488 lumens, whereas the old Luxeon III could only manage about 80 lumens. I’ve done the modification informally for a couple of customers, too, and they’ve been happy with it. There’s been more interest recently, so I’ve made this upgrade available in the Solidlights on-line shop. It’s listed as part number 99002 under ‘service and repairs’. This entry was posted in Projects and tagged cycling, electronics, repair, upgrade on June 24, 2015 by martinjonestechnology.